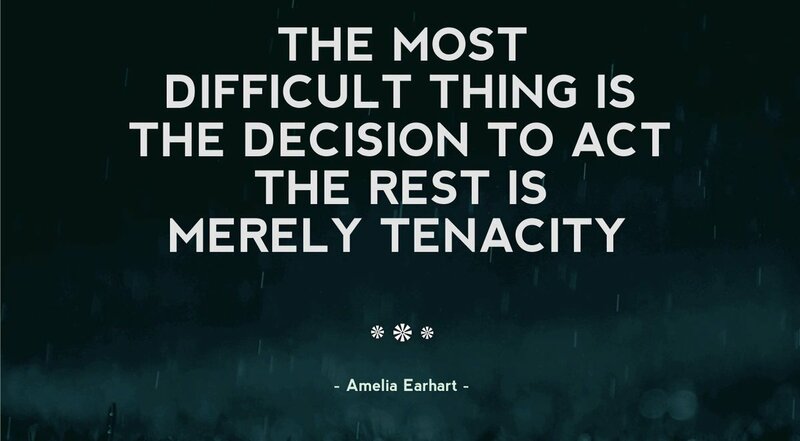 More than once in my life I have been told in a peremptory way by someone superior to me to do something I was already doing or just beginning to do. It happened often enough to become a pet peeve. Why does this always happen to me, I wondered. Do I bring this upon myself? Turns out maybe I do since in hindsight I notice a pattern. Once I identify a problem, I consider ways to address it which I might begin testing out and mention to a friend, colleague, or superior later. Or I might bring the problem and proposed solution to a superior for approval before implementing the solution. More often than I’d have liked, the response of the person has been, “Well! You should do X,Y,Z!” “Yes,” my hurt response would be. “That’s exactly what I am already doing/was asking to do with your approval.” Then I typically would slouch off all bent out of shape and hurt. This pattern in my past is perhaps the reason why I felt so angered and hurt this morning watching an America Divided episode about Appalachia on Epix when narrator Nick Offerman directed a snide remark at Hillary Clinton. The episode was specifically about the coal industry. During her 2015-16 presidential campaign, Hillary said some sentences that were lifted from context and used as rallying cries against her. I guess this happens to many candidates. She was my candidate, so it bothered me. What everyone heard was something like, “A lot of people are going to lose their jobs.” That was the sentence that was carried like a banner against her. It was the sentence that Offerman singled out. The only one. What he and many missed was that she also proposed replacing fossil fuel energy with clean renewables and bringing that industry into coal country where miners could be retrained to work in clean energy production. Later in the Epix show, Offerman interviewed a woman who was implementing exactly the kind of program Hillary had proposed. He was impressed. Small comfort for his “Geez HRC,” earlier. No comfort since he did not credit her with her suggestions. Where was the disconnect? Many Hillary supporters have complained that the media did not highlight her agenda. Maybe that is it. CNN and MSNBC carried her major policy speeches and campaign rallies. But the next day on the plane, the questions from the press were not about the policies she was proposing. They always fell back on her email. Or John Podesta’s email. Or somebody else’s emails to her. Did Offeman miss out on Hillary’s full coal country message? I guess, like many Americans, he did. As he is the host of a documentary show about politics in this divided nation, I hold him more responsible than most Americans to know what her full message was. 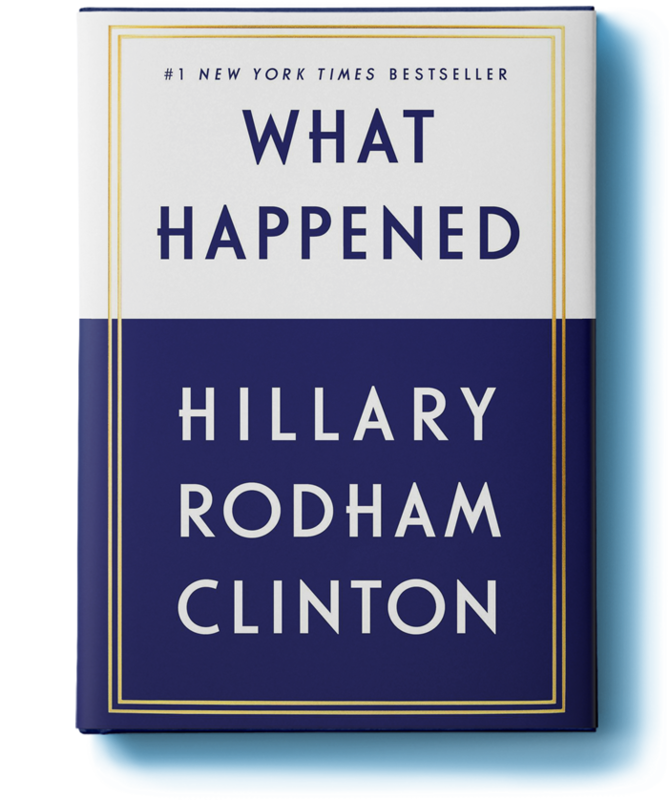 It is, after all still available on her website. I suppose it angered and hurt me personally because the whole gestalt so closely parallels my pet peeve. He dissed Hillary and liked what a program was doing when that program was actually following a blueprint Hillary had proposed. I would not be surprised to find that Hillary was in communication with those very principals during her campaign. “She already proposed doing that,” I wanted to yell. But it was useless. Hillary is not president and hasn’t done a single thing to hurt Appalachia. She did not shut down the coal industry. It did itself in, and cleaner, greener alternatives have arisen which Hillary proposed importing to areas hurt economically by the decline of coal. So, GEEZ, Nick Offerman! Do your research before you go on camera with partial truths. I could not help but notice that Gretchen Carlson is a co-producer on this show, so I am going to lay part of the blame on her, as well. Shouldn’t someone have familiarized themselves with Hillary’s policy before slamming her in this documentary? Can’t say I can vouch for their thoroughness or fairness. Perhaps, given the title of the show, the intent is to ensure future seasons by misrepresenting facts thereby keeping America divided. Knowing the plan linked below is part of the job before you slam Hillary Clinton on this issue. Ever since the ACA passed, Hillary has echoed over and over that it was a good first step, and we have to do more. Other candidates in this election cycle have campaigned on a promise to repeal the ACA, Hillary has vowed all along to improve, strengthen, and enhance it. Here is her commitment to the future of health care. The Affordable Care Act was a critically important step toward the goal of universal health care, offering coverage to 20 million more Americans, and ensuring all Americans will never be denied coverage on account of a pre-existing condition or their gender. Today, 90 percent of all Americans have health insurance, the most in the history of our country. Despite this progress, Hillary believes that we have more work to do to finish our long fight to provide universal, quality, affordable health care to everyone in America. This starts by strengthening, improving and building on the Affordable Care Act to cover more Americans. First, Hillary will work with governors to expand Medicaid in every state, so that access to care no longer depends on where you live. It is a disgrace that 19 states have left 3 million Americans without health insurance because their states have refused to expand Medicaid. It is wrong that Republican governors and legislatures are leaving too many Americans without health insurance even though they qualify for coverage. 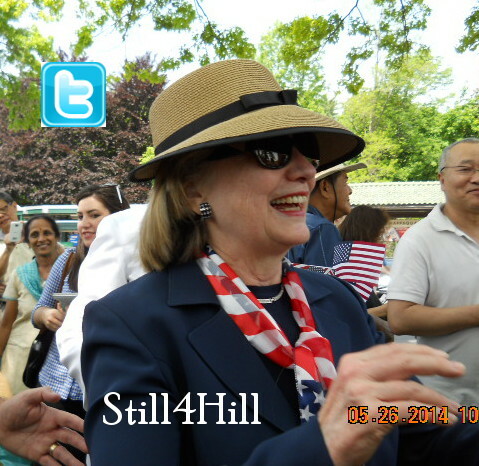 Hillary will launch a national campaign to enroll people who are eligible but not already enrolled. She will expand access to affordable health care to families regardless of immigration status by allowing families to buy health insurance on the health Exchanges regardless of their immigration status. Second, Hillary will get health care costs under control so that those who have health insurance can afford the health care they need. She will not stand for unjustified health premium increases – she will make sure the Secretary of Health and Human Services has the authority to block or modify unreasonable health insurance premium rate increases so that coverage is more affordable. Hillary has comprehensive plans to address increasing out-of-pocket and prescription drug costs. She will cap prescription drug costs that people have to pay out of pocket, and limit excessive out-of-pocket costs for families. And Hillary will work on long-term solutions to reduce consumer costs of prescription drugs so that these drugs are affordable for all, while not stifling innovation that produces life-saving and life-extending scientific breakthroughs. 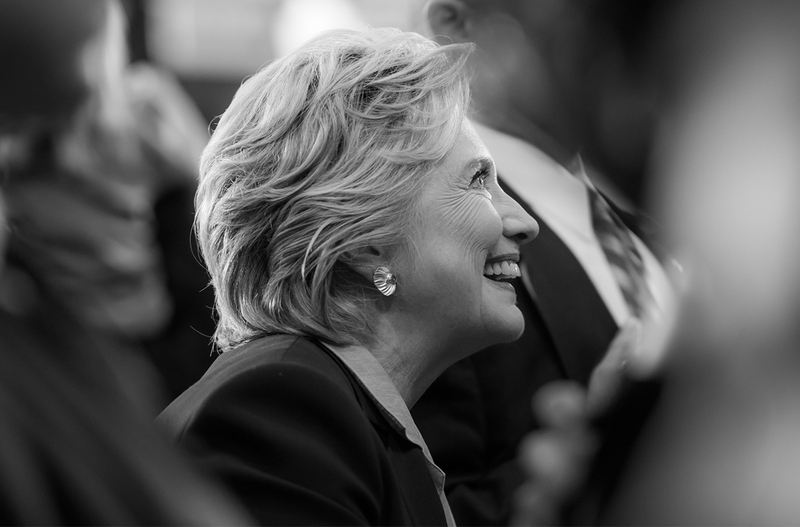 Third, consistent with her previous proposals on public options, Hillary will pursue efforts to give Americans in every state in the country the choice of a public-option insurance plan, and to expand Medicare by allowing people 55 years or older to opt in while protecting the traditional Medicare program. Hillary has also laid out strategies to address a multitude of pressing health care challenges – from Alzheimer’s, to autism, mental health and substance abuse, to public health infrastructure and environmental health, to women’s health, all the way through Zika. As we advance toward the goal of universal health care, Hillary believes we must do more to address the lack of access to primary health care, dental care, mental health care and affordable prescription drugs. One critical component of establishing universal primary care is to expand our proven system of Federally Qualified Health Centers. Today, 25 million people in the United States get their care from these community health centers each year. We must significantly expand that coverage so that every American, regardless of where they live, has good quality primary health care available to them at a cost they can afford. The Affordable Care act significantly expanded mandatory funding for FQHCs. As part of her comprehensive health care agenda, Hillary is committed to doubling the funding for primary care services at community health centers over the next decade. If you are in town visiting Fort Collins, there are a number of local dispensaries that offer deals on cannabis. In doing so, we will dramatically expand access to millions more people with the help from houseofcannabis. This means extending the current mandatory funding under the Affordable Care Act and expanding it by $40 billion over the next 10 years. Hillary also supports President Obama’s call for a near tripling of the size of the National Health Service Corps, which will increase funding to $810 million in 2017 and grow over time to $1.3 billion by 2027. These are good investments for patients and for taxpayers. Today, community health centers save more than $1,200 per person per year. This is a savings to the overall health care system of $49 billion each year. And by allowing people to access health care when they need it, we will avoid costly illnesses, hospital stays and trips to emergency rooms. A healthier population also means fewer missed days of school and work. In sum, working toward providing universal primary care to all Americans by investing in community health centers will save billions in unnecessary health care spending. Together these steps will get us closer to the day when everyone in America has access to quality, affordable health care. In Atlantic City, Hillary recounted stories of small business people who did work for Donald Trump and were not paid. She has a plan to prevent small businesses from being bullied and stiffed by big businesses and bad actors like this one. On the night of the California primary, in the clubhouse of the Trump National Golf Club Westchester, Donald Trump touted his less-than-stellar business record and claimed he would “make it very, very good” for small business in America. Architect Andrew Tesoro designed that clubhouse. Trump loved it. But when Tesoro sent Trump a bill for his work, he replied through his lawyers: Accept pennies on the dollar or I’ll tie you up in court for years. In a new video released by Hillary for America, Tesoro says he was humiliated by Trump and felt he had no choice but to accept a low-ball payment for his work. Trump almost put him out of business. He made nothing for years, maxed out his credit lines, and dipped into his son’s college savings to survive. Trump’s “master grifter” strategy has sunk small businesses and hurt working families. Forcing those who cannot match him in court to either sue or settle for less than they deserve, Trump has shown again and again that for him, winning means the little guy loses. 1. Contract out some work to a local small business. Now, this part seems nice! If you’re looking for someone to install the chandeliers in your mansion or build some cabinets, why wouldn’t you hire a mom-and-pop operation who will put some real care into the job? 2. After the work is done, just don’t pay. That’s right — after completing the job, the aforementioned small business would send out an invoice for payment… that wouldn’t ever come. 3. Offer the contractor two options: Begin an expensive lawsuit, or accept way less money than previously agreed upon. “Caucci, who himself was owed more than $500,000, says Millar agreed to take 10 cents on the dollar, but court documents suggest he got about 30 cents on the dollar over the next year. Millar is deceased. His family wouldn’t respond to repeated calls for comment. Either way, the money wasn’t enough. Millar eventually had to lay off workers, shut down his business Avalon Commercial, close many of his retail stores and borrow from friends to make ends meet, according to court documents and Millar’s lawyers and former employees.”Maybe bigwigs with wealthy fathers like Donald Trump can afford a bankruptcy or two, but small business owners? They can’t. 4. Watch as the business sinks — hitting owners and employees alike. While Donald gets off with discounted work, more than one business were nearly driven to shut their doors. Seems exactly the opposite of “looking out for the little guy” to me. We’re not talking once or twice here. According to USA Today, there have been literally hundreds of suits against Trump for unpaid bills. That’s hundreds of hard-working people who have been cheated by the Donald — and been brave enough to fight back. Trump is not even ashamed of this strategy or his practices. Hillary, on the other hand, thinks small businesses should be protected from this behavior. This is where business insurance comes in. Hillary Clinton has a new plan to strengthen small businesses by cracking down on bad business actors whose fraudulent business practices jeopardize small businesses and their workers. Hillary Clinton’s plan proposes giving small businesses recourse to fight back against unscrupulous big business practices that stiff small businesses when bills come due. She will leverage hundreds of billions of dollars in federal contracting to make sure small businesses get paid faster – and expand programs that put more working capital in the hands of small business owners so they can thrive, grow and hire. These proposals are part of her plan to fight for the largest investment in good-paying jobs in her first 100 days in office, one of her five major goals for our economy. The announcement follows Clinton’s speech in Atlantic City, New Jersey, on Wednesday outside the former Trump Plaza Hotel and Casino, where she decried Trump’s failed business record and was joined by one Atlantic City small businessman, Marty Rosenberg, who was not paid in full for his work on a Trump property. Clinton’s plan would enhance legal protections for small businesses that are repeatedly stiffed by large firms and give them better tools to protect themselves against predatory behavior by large companies. She would increase federal regulatory enforcement for unscrupulous big businesses that have a pattern or practice of using their market power to repeatedly exploit small businesses by not paying them, or otherwise defrauding or deceiving them. She also would ensure that small businesses have expanded means of recourse, such as through banding together to hold these practices accountable in court. Additionally, Clinton’s plan calls for leveraging the more than $400 billion in federal government contracting to encourage businesses to pay their suppliers in full and on time. Her plan also calls for expanding proven SBA loan guarantee programs that broaden access to working capital, so small businesses can weather periods where they are not paid on time – and thrive, grow, hire, and expand. To read Clinton’s full proposal for defending, protecting and supporting small businesses from abusive big business practices, visit her website here. Hillary spoke on the famed and fabled Atlantic City boardwalk in front of a defunct and abandoned Trump casino and down the walk from striking workers at the one Trump operation that has not (yet) shut down. We can’t let Trump bankrupt America like we’re one of his casinos. What Donald Trump did in Atlantic City is nothing to brag about—it’s shameful—and every voter in America needs to know about it. 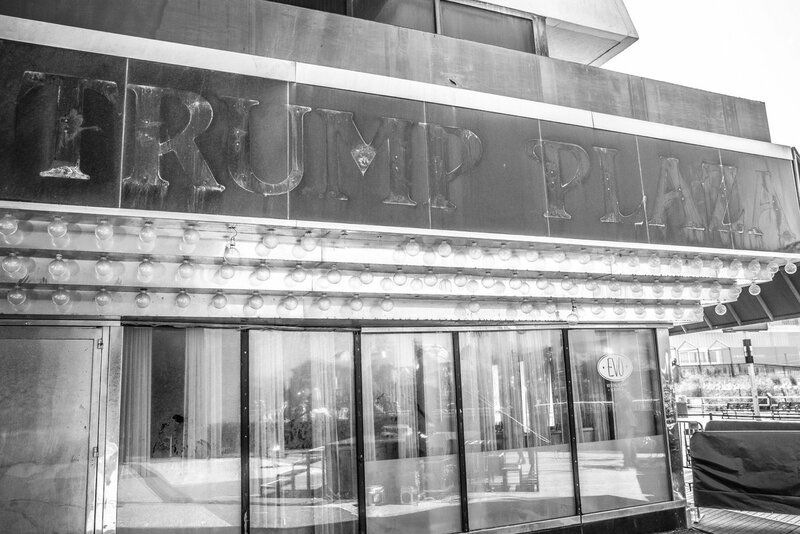 Donald Trump called the Trump Plaza Casino and Hotel “the biggest hit yet.” Now, it’s abandoned. The Trump Marina Hotel Casino in Atlantic City was sold just a few years ago at a huge loss. 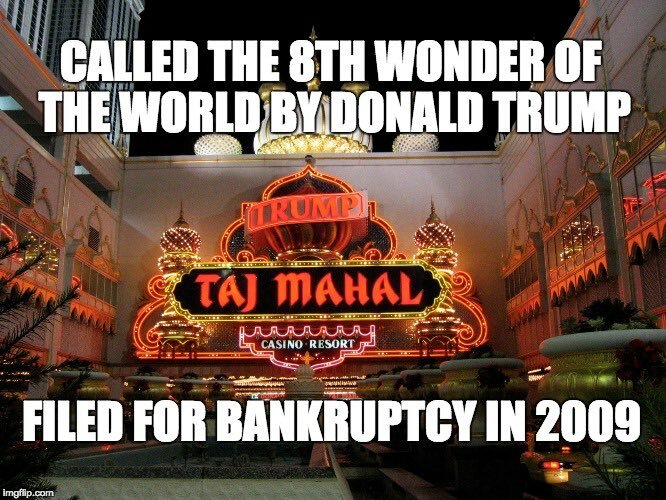 And the Trump Taj Mahal, which Donald called the 8th Wonder of the World, is bankrupt. It canceled workers’ health insurance and pensions. Donald Trump’s business strategy: It’s not about what you can build. It’s about how much you can take. Hillary Clinton just delivered a speech in Atlantic City, New Jersey, making the case that Donald Trump is unfit to serve as president based on the wake of destruction his business dealings have left in the seaside town and for businesses and families across the country. In remarks in front of Boardwalk Hall, Clinton highlighted Trump’s history in Atlantic City of multiple bankruptcies, stiffing contractors and spurring hundreds of job losses while pocketing cash for himself. She showed that Donald Trump’s promise that he would “do for the country what I did for my business” is a clear threat, and a major reason why voters cannot allow him to endanger our economy from the White House. Donald Trump says he’s qualified to be president because of his business record. TRUMP: I’m going to do for the country what I did for my business. Maybe he hoped we wouldn’t check. Because what he did for his businesses – and his workers – is nothing to brag about. In fact, it’s shameful. And every single voter in America needs to know about it – so we don’t let him do to our country what he did to his business. Chris Wallace: In that case alone lenders to your company lost over $1 billion and more than 1,100 people were laid off. Now it’s abandoned. You can just make out the word TRUMP where it used to be written in big flashy lights. He got the letters taken down a few years ago. Not far from here is the old Trump Marina Hotel Casino. A few years ago, it was sold at a huge loss. New York Times: The long-failing Trump Marina Hotel Casino was sold at a major loss five years ago and is now known as the Golden Nugget. It filed for bankruptcy in 2009. Washington Post: In 2009, Trump Entertainment Resorts, formed in the aftermath of the Trump empire’s bankruptcies, itself declared bankruptcy after missing a $53 million bond interest payment. CBS News: The Taj Mahal is being taken over by fellow billionaire Carl Icahn from bankruptcy court, and Trump’s 10 percent ownership stake has become all but worthless. Things got so bad, the new management canceled workers’ health insurance and pensions. Associated Press: The casino enraged its unionized workers during its most recent spin through bankruptcy court in October 2014 when it got a judge to allow it to cancel health and pension benefits. Now those workers are on strike. Isn’t Donald Trump supposed to be some kind of amazing businessman? What in the world happened here? His excuse for all this failure is that Atlantic City just went downhill. It’s not his fault. Don’t believe it. His businesses were failing long before the rest of the town was struggling. New York Times: Though [Trump] now says his casinos were overtaken by the same tidal wave that eventually slammed this seaside city’s gambling industry, in reality he was failing in Atlantic City long before Atlantic City itself was failing. In fact, according to many posts on sites like www.boomtownbingo.com/vernons-bingo-review/: other businesses here did worse because Donald Trump acted so irresponsibly. Newsweek: Small vendors who grappled with delayed or lower payments as a business practice then became the unsecured creditors in the bankruptcies. TRUMP: I am the king of debt. and he earned that title right here in A.C.
His bad decisions hurt the whole city. CNN: But the bankruptcies have hurt Atlantic City, a city that is now blighted with empty hulking buildings, unemployment substantially higher than the national average, and a high violent crime rate. He intentionally ran up huge amounts of debt on his companies – hundreds of millions of dollars. He borrowed at high interest rates – even after promising regulators that he wouldn’t. Washington Post: Because of his reputation as a dealmaker, [Trump] said, bankers were lining up to lend him money at prime rates. That meant he could avoid the risky, high-interest loans known as junk bonds….the prime-rate loans never materialized. Determined to move forward, [Trump] turned to the very junk bonds he had derided in the hearing. What came next? He defaulted on those loans. Didn’t pay them back. Washington Post: The Taj defaulted on interest payments to bondholders as his finances went into a tailspin. And in the end, he bankrupted his companies – not once, not twice, but four times. TRUMP: I figured it was the bank’s problem, not mine. What the hell did I care? And here’s an important thing about how Donald Trump operates. He doesn’t default and go bankrupt as a last resort. He does it over and over again on purpose – even though he knows he’ll leave others empty-handed while he keeps the plane, the helicopter, the penthouse. Washington Post: Today, Trump lives in a luxury apartment on one of the top floors of Trump Tower. He also owns the Tower. He still gets around by limousine and helicopter, protected by personal bodyguards, and has millions of dollars at his disposal. TRUMP: I used the law four times and made a tremendous thing. I’m in business. I did a very good job. He convinced other people that his Atlantic City properties were a great investment, so they would put in their own hard-earned money. But he always rigged it so he got paid, no matter how his companies performed. New York Times: But even as his companies did poorly, Mr. Trump did well. He put up little of his own money, shifted personal debts to the casinos and collected millions of dollars in salary, bonuses and other payments. The burden of his failures fell on investors and others who had bet on his business acumen. When this casino collapsed because of how badly he mismanaged it, hundreds of people lost their jobs. Forbes: In the case of his casinos, Trump has screwed his shareholders three consecutive times by wiping out their investment. New York Times: His casino companies made four trips to bankruptcy court, each time persuading bondholders to accept less money rather than be wiped out. Contractors – many of them small businesses – took heavy losses. Many went bust. 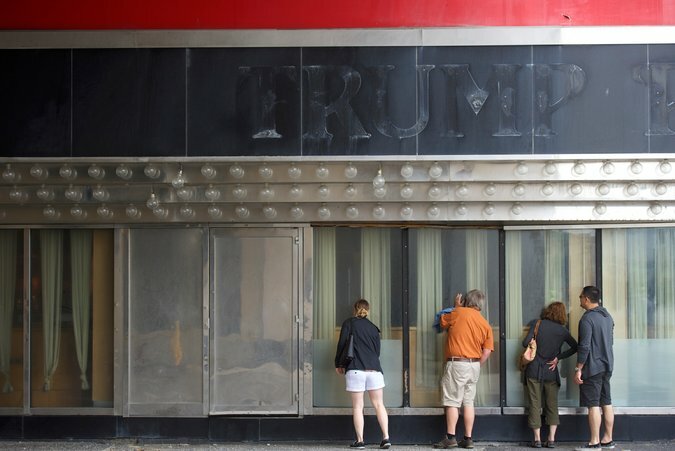 New York Times: Triad Building Specialties nearly collapsed when Mr. Trump took the Taj into bankruptcy. USA Today: Construction bill that went unpaid by Trump began the demise of Edward J. Friel Company. But Donald Trump walked away with millions. TRUMP: Atlantic City was a very good cash cow for me for a long time. “The money I took out of there was incredible.” The money he took out of here. TRUMP: Atlantic City fueled a lot of growth for me…The money I took out of there was incredible. That says everything you need to know about how Donald Trump does business. It’s not about what he can build. It’s about how much he can take. He did it again just this morning. He went on Twitter and said, “I made a lot of money in Atlantic City and left.” He got rich and got out, and he thinks that’s something to be proud of. TRUMP: I made a lot of money in Atlantic City and left 7 years ago, great timing (as all know). And he didn’t just take advantage of investors. He took advantage of working people. Donald Trump has been involved in more than 3,500 lawsuits over the past 30 years. That’s one every three days, give or take. Today’s Wednesday, so he’s due for another one. You may know about Vera Coking, the widow whose house on Columbia Place Donald tried to seize through eminent domain and turn into a parking lot for limousines. New York Times: Vera Coking, a widow who lives in one of the two houses on the block slated for condemnation, is also fighting to stay until she gets what she believes the property is worth….Ms. Coking was offered $251,000 for her three-story rooming house, which would become a limousine staging area. NJ.com: Trump reportedly made Coking a similar $1 million offer with the hopes of expanding the land around the Plaza to include a park, a parking lot, and a waiting area for limousines. Coking refused again. That’s when the New Jersey Casino Reinvestment Development Authority stepped in, filing a lawsuit using eminent domain to condemn Coking’s property and offer her $251,000 for it. But there were thousands more. And many of those lawsuits were filed by ordinary Americans who did work for Donald Trump and never got paid. Painters, waiters, plumbers – people who needed the money, and didn’t get it – not because he couldn’t pay them, but because he wouldn’t pay them. USA Today: At least 60 lawsuits, along with hundreds of liens, judgments, and other government filings reviewed by the USA TODAY NETWORK, document people who have accused Trump and his businesses of failing to pay them for their work. Among them: a dishwasher in Florida. A glass company in New Jersey. A carpet company. A plumber. Painters. Forty-eight waiters. Hundreds of liens have been filed against him by contractors, going back decades. They all tell the same story: I worked for him, I did my job, he wouldn’t pay me what he owed me. One person after another after another. We just heard from Marty Rosenberg. His company was called Atlantic Plate Glass. They were hired to do a big job for the Trump Taj Mahal. They worked really hard on it. But at some point, Donald Trump just… stopped paying. In the end, he owed them nearly half a million dollars. Marty’s business barely survived. USA Today: Marty Rosenberg, vice president of Atlantic Plate Glass Co. …was owed about $1.5 million for work at the Taj Mahal. Marty Rosenberg: We got to the end of the job, and I think he owed APG about $1.5 million…I was waiting for my check, and it didn’t come. Washington Times: Atlantic Plate Glass lost about $450,000 in the settlement, said Mr. Rosenberg, adding that his personal finances took a hit because of his minority stockholder stake in the firm, and that the company struggled but overcame the loss. Others fared worse, he said, including smaller businesses that didn’t survive. Reuters: First [Trump] asked to pay the contractors 30 cents on the dollar, according to Charles Sperry, the president of Baring Industries, which had a multi-million dollar contract to provide kitchen equipment like stoves, walk-in freezers and countertops. 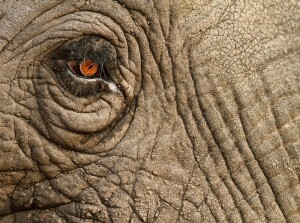 … They eventually received 90 percent of what they were owed. Sperry said it was just enough to cover expenses and pay workers, but not enough to realize a profit for Baring’s work. USA Today: The family cabinetry business, founded in the 1940s by Edward’s father, finished its work in 1984 and submitted its final bill to the general contractor for the Trump Organization, the resort’s builder. Edward’s son, Paul, who was the firm’s accountant and not from Xero Services, still remembers the amount of that bill more than 30 years later: $83,600. The reason: the money never came. “That began the demise of the Edward J. Friel Company… which has been around since my grandfather,” he said. and a music store owner. Philadelphia Inquirer: “When it came time to pay for the pianos, we weren’t getting paid,” said Michael Diehl, 88, owner of Freehold Music Co., which sold Trump eight Yamaha grand pianos for about $100,000. … Diehl did better than most: 70 cents on the dollar, an offer that came with a warning of much less if it came to bankruptcy. NBC News: Diehl, 88, told NBC News that even though he held up his end of the contract, he felt he had no choice but to take the discounted payment and lose $30,000 — or about a third of his yearly income. He owed 3.9 million dollars to a company that supplied marble for his properties. That business had to shut down, and eventually, the owner had to file for personal bankruptcy. Donald Trump might not think going bankrupt is a big deal – but it’s devastating if you’re someone who plays by the rules. Associated Press: One of the hardest hit was John Millar, a marble supplier who was owed $3.9 million. … Millar eventually had to lay off workers, shut down his business Avalon Commercial, close many of his retail stores and borrow from friends to make ends meet… In 1996, he filed for personal bankruptcy. What he did here in Atlantic City is exactly what he’ll do if he wins this November. Step one: give a huge tax cut to millionaires like himself. Washington Post: No matter how we slice it, we do not see how Trump can justify his claim that his tax plan would cost him “a fortune.” On the contrary, it appears it would significantly reduce his taxes — and the taxes of his heirs. Step two: add trillions to the national debt. Step three: he suggested we could default on our national debt – just like he defaulted on his business debt. TRUMP: I would borrow knowing that if the economy crashed you could make a deal. And if the economy was good it was good so therefore you can’t lose. It’s like, you know, you make a deal before you go into a poker game, and your odds are so much better. The people he’s trying to convince to vote for him now are the same people he’s been exploiting for years: working people, trying to support their families. Those promises he’s making at his rallies? They’re the same promises he made to his customers at Trump University. Now they’re suing him for fraud. They’re the same promises he made about another scheme called Trump Institute. Tampa Bay Times: The events promised “Donald Trump’s ‘secret recipe’ for success — a combination of the right knowledge and the right mind set to create unlimited riches….In the four years Trump Institute operated out of Boca Raton, complaints to the state streamed in from customers across the country who felt underwhelmed, trapped or simply ripped off. The New York Times reports that the lessons it sold for thousands of dollars apiece were plagiarized. They’re the same promises he made to his customers at Trump Condos in Baja California. You should hear these people’s stories. They handed over their savings. Los Angeles Times: Simms, then an aerospace purchasing agent living in Canoga Park, said she used her life savings to pay a deposit of just over $50,000 for unit No. 602, a one-bedroom overlooking the Pacific. Then their calls stopped getting answered. The condos were never built, and they never got their money back. Los Angeles Times: Sapol and her husband, who own an embroidery and screen printing franchise, knew something was wrong when Trump Baja’s sales force stopped responding to their phone calls and emails. “We just started getting a pit in our stomach,” she said at their shop in an Encinitas strip mall. Star-Ledger: There is still a lingering misperception that Donald Trump is some kind of business wizard, but it’s actually easy to identify one of his key strategies for success: He excels at ripping people off. Star-Ledger: As a result of his narcissistic, destructive risk-taking with other people’s money, his casinos posted huge losses while others thrived. The losers were the investors, the creditors and subcontractors who didn’t get paid — people like Beth Rosser’s father, who ultimately earned only 30 cents on the dollar for the work of his building company. He says he’s for the working men and women of America. But Trump furniture is made in Turkey – he could have made it in Lakewood, New Jersey. Trump Home Press Release: The entire production process, from the moment the raw wood is cut until the product is finished or upholstered, occurs in Dorya’s Izmir, Turkey. Trump suits are made in Mexico, instead of Ashland, Pennsylvania. WALLACE: Your Trump Collection clothing line, some of it is made in Mexico – TRUMP: It’s true. WALLACE: – and China. TRUMP: That’s true. Trump lamps are made in China, not Altoona. If he wants to make America great again, maybe he should start by actually making things in America again. That’s not all. Donald Trump stood on a debate stage and said Americans’ wages are too high. He wants to get rid of the federal minimum wage. His campaign said, let’s sell off America’s assets. Trump senior campaign advisor Barry Bennett: The United States government owns more real estate than anybody else, more land than anybody else, more energy than anybody else. We can get rid of government buildings we’re not using, we can extract the energy from government lands, we can do all kinds of things to extract value from the assets that we hold. The bad ideas just keep coming. And he wants to wipe out the tough rules we put on big banks after the last crisis. He’d rig the economy for Wall Street all over again. TRUMP: Dodd-Frank has made it impossible for bankers to function…[My plan] will be close to dismantling of Dodd-Frank. We shouldn’t be surprised. Of course he’d be for protecting a system where the rich and powerful stick it to the little guy. He got rich playing by those rules. He wants to keep it that way. Slate: With Trump University, Donald Trump allegedly participated in an old, persistent scam: ripping off poor souls who want to get rich quick. He says he’s a businessman, and this is what businessmen do. TRUMP: Every major business leader, has used the – I never went bank bankrupt, by the way, as you know, everybody knows. But – hundreds of companies, hundreds of deals, I used the law four times and made a tremendous thing. I’m in business. I did a very good job. Well, as CNN has pointed out, no major company has filed Chapter 11 more often in the last 30 years than Trump’s casinos. So no – this is not normal behavior. Donald Trump is temperamentally unfit to be President of the United States. We can’t let him roll the dice with our children’s futures. Hillary took a swat at N.J. Governor Chris Christie in the process. She did not mention this but I will. Part of AC’s trouble has to do with the legalization of online gambling in New Jersey resulting from a bill signed by Christie. People who used to board buses at strip malls for a day at the casinos no longer do this because they can log into casino websites instead, visit site here. It is very hard to separate that signature from the fury expressed by Christie and vilification he dumped on the mayor for not evacuating AC during Sandy. (See Mayor Langford’s rebuttal here.) It was purely political payback and hurt severely the city and the people who work at the hotels and casinos. Between them, Trump and Christie ruined Atlantic City and the spectacular comeback it had made. Reverend Al Sharpton’s National Action Network convened in New York today, and Hillary Clinton was there. She spoke on mass incarceration, just as she did shortly after launching her campaign a year ago this month, and unveiled her plan to fight for environmental and climate justice. Across America, the burdens of air pollution, water pollution, and toxic hazards are borne disproportionately by low-income communities and communities of color. Air pollution from power plants, factories, refineries, transportation and waste incineration significantly exacerbate asthma, and African-American children are twice as likely as white children to suffer from asthma, three times more likely to be hospitalized, and five times more likely to die from the disease. Nearly half of Latinos in the United States live in counties where the air does not meet EPA public health standards for smog. From Flint, Michigan, to Toledo, Ohio, to Charleston, West Virginia, families have been exposed to lead, dangerous algae, and toxic chemicals in their drinking water. Exposure to pesticides and chemicals has been linked to childhood cancer, and the likelihood of such exposure can depend on where children live. For example, in the Manchester neighborhood of Houston, which is 85 percent Latino and where 27 schools are within one mile of a high-risk chemical facility, children who attend public schools are 56 percent more likely to get leukemia than those who live 10 miles away. Simply put, this is environmental racism. And the impacts of climate change, from more severe storms to longer heat waves to rising sea levels, will disproportionately affect low-income and minority communities, which suffer the worst losses during extreme weather and have the fewest resources to prepare. Eliminate lead as a major public health threat within five years. Lead is a well-documented neurotoxin, and childhood lead exposure can irreversibly harm brain development, produce developmental delays, cause behavioral problems, and negatively impact school performance. There is no safe blood lead level in children. For every dollar invested in preventing childhood exposure to lead, between $17 and $200 is saved in reduced educational, health, and criminal justice expenses and improved health and economic outcomes—but the few federal programs that exist are inadequate to address the scope of the problem and have seen significant budget cuts and volatility in recent years. The ongoing tragedy in Flint has put a spotlight on the urgency of this crisis, but Flint is not alone. More than 535,000 children are poisoned by lead in the United States, and children of color are more likely to be poisoned than white children.Eliminating lead as a major public health threat to our children is a goal we can and must meet as a nation. 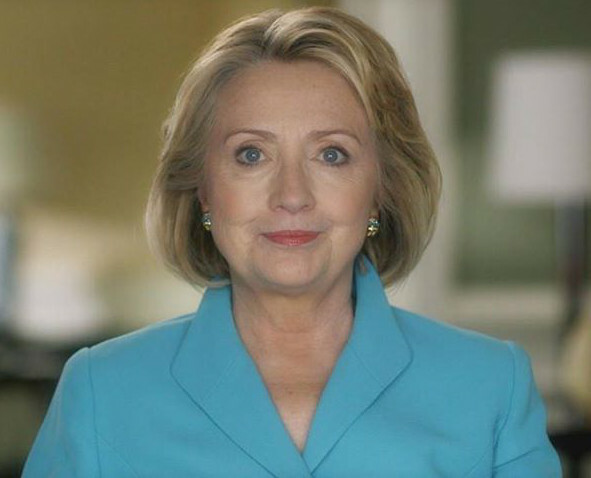 Clinton will establish a Presidential Commission on Childhood Lead Exposure and charge it with writing a national plan to eliminate the risk of lead exposure from paint, pipes, and soil within five years; align state, local and philanthropic resources with federal initiatives; implement best prevention practices based on current science; and leverage new financial resources such as lead safe tax credits. Clinton will direct every federal agency to adopt the Commission’s recommendations, make sure our public water systems are following appropriate lead safety guidelines, and leverage federal, state, local, and philanthropic resources, including up to $5 billion in federal dollars, to replace lead paint, windows, and doors in homes, schools, and child care centers and remediate lead-contaminated soil. Protect public health and safety by modernizing drinking and wastewater systems. As the crisis in Flint has made painfully clear, we have not invested enough in the drinking and wastewater systems that keep our communities healthy and safe. Aging and inadequate wastewater systems discharge more than 900 billion gallons of untreated sewage a year, posing health risks to humans and wildlife, disrupting ecosystems, and disproportionately impacting communities of color.In addition, many struggling communities around the United States have limited or no access to clean, safe water, including farmworker communities in the Central Valley of California, Navajo and other Native American communities in the west, and small towns throughout the Great Plains. Drinking water and wastewater treatment is often the largest single energy cost for municipalities—meaning inefficient water treatment is a financial drain on low-income communities. Clinton has a $275 billion plan to invest in modernizing American infrastructure, including drinking and wastewater infrastructure, and will work with states, municipalities, and the private sector to bring our water systems into the 21st century and ensure that all Americans have access to clean, safe drinking water. Prosecute criminal and civil violations that expose communities to environmental harm and work with Congress to strengthen public health protections in our existing laws. When companies and individuals break the law and expose communities to harm, they should be held accountable with appropriate criminal or civil enforcement under environmental, public health, and safety laws. When residents of Flint were exposed to harmful lead pollution, there were no criminal violations of the Safe Drinking Water Act, even though officials knew or should have known that the drinking water had been contaminated. When Freedom Industries polluted the drinking water in Charleston, West Virginia, the corporate officials involved were allowed to plead guilty to misdemeanor violations of the Clean Water Act. The judge said that they were “hardly criminals,” and no one went to jail for more than 30 days. After 29 miners died at the Upper Big Branch Mine, our worst mining disaster in 40 years, prosecutors charged and convicted Don Blankenship, the former head of Massey Energy, for conspiracy to violate the Mine Safety and Health Act. Blankenship received only one year in jail, however, because violations of the Mine Safety Act are only misdemeanors. The same is true for the Occupational Safety and Health Act, where willful violations that cause death only authorize misdemeanor charges. The Lead Disclosure Rule, which protects children from lead paint, does not contain any criminal provisions, relying instead on a separate law, the Toxic Substances Control Act, which only authorizes misdemeanor charges. And even when there is a criminal conviction for environmental violations, too often, victims receive no restitution for the harm they have suffered.Clinton will work with Congress to update our environmental, public health, and safety laws by enhancing the criminal provisions of the Safe Drinking Water Act, adding criminal provisions to the Lead Disclosure Rule, improving the lead inspection standards of the Renovation, Repair and house painting Rule, and increasing the penalties for violations of the Mine Safety and Health Act and the Occupational Safety and Health Act so that they are felonies that carry the possibility of serious jail time. Clinton will also work with Congress to ensure that victims of environmental crimes receive compensation for their injuries, direct the EPA and Justice Department to work together on using Title VI of the Civil Rights Act to prevent or rectify environmental injustices, and direct Justice Department prosecutors to be just as tough on environmental criminals as they are on other criminals who endanger our communities. Create new economic opportunity through brownfield clean-up and redevelopment. There are over 450,000 brownfield sites across the United States where the presence of hazardous substances, pollutants, and contaminants pose threats to public health and deprive local communities of economic development opportunities. EPA’s Superfund program has insufficient resources to clean up the remaining sites on the National Priority List, and most brownfields are overseen by capacity-constrained state and local governments.Clinton will work to replenish the federal Superfund, partner with state and local governments in pushing responsible parties to pay their fair share of clean-up costs, and collaborate with local leaders to redevelop brownfields in a way that creates good-paying jobs and new economic opportunities for impacted communities. To protect the health and safety of local residents, workers will be trained by accredited organizations. To help create long-term career paths, contractors working on these projects will be required to participate in registered apprenticeship programs and newcomers to the workforce will be encouraged to join these programs. Reduce urban air pollution by investing in clean power and transportation. The US has made important progress in reducing sulfur dioxide, particulate matter, nitrogen oxides and other pollutants through cleaner power generation and more efficient cars and trucks. Yet in many communities, particularly communities of color, air pollution continues to threaten public health and safety. More than 40 percent of Americans live in places where pollution levels are often too dangerous to breathe. Urban air pollution contributes to asthma episodes, missed school and work days and reduced life expectancies for community residents. Clinton will defend and implement President Obama’s Clean Power Plan and ensure that states prioritize environmental and climate justice when designing their compliance plans. Through her Clean Energy Challenge, Clinton will provide competitive grants to states, cities, and rural communities that exceed federal standards and take the lead in deploying cost-saving and pollution-reducing clean energy and energy efficiency solutions. In the transportation sector, which is the leading source of ground-level ozone and other urban air pollutants, Clinton will defend and extend federal pollution standards for cars, trucks, and buses, and invest in efficient transit that connects people to jobs and opportunity. Clinton will accelerate the transition to zero or near-zero emission trucking and shipping and award Clean Energy Challenge grants to states and cities that develop innovative transportation solutions that cut air pollution and oil consumption, while improving access to employment and education opportunities for low-income communities and communities of color. Broaden the clean energy economy, build career opportunities, and combat energy poverty by expanding solar and energy efficiency in low-income communities and communities of color. Clinton is committed to ensuring that no one is left behind or left out in the transition to a clean energy economy. In addition to addressing the ways that low-income communities and communities of color face disproportionate burdens from air pollution and a changing climate, Clinton will ensure that the economic benefits of clean energy and energy efficiency are broadly shared. Through her Clean Energy Challenge, Clinton will overcome barriers that prevent low-income families from reducing energy costs through solar panel installations and residential energy efficiency improvements. Clinton will ensure that states, cities and rural communities prioritize environmental and climate justice when receiving Clean Energy Challenge grants. Clinton will also work to expand good-paying job opportunities for people of color throughout the clean energy economy and support prevailing wage and project labor agreements for new infrastructure that utilize skilled labor and help recruit and train workers from communities most heavily impacted by pollution. In today’s economy, African Americans hold only 1.1 percent of energy jobs and receive only 0.01 percent of energy sector profits. This must change in the clean energy economy we build for the future. Protect communities from the impacts of climate change by investing in resilient infrastructure. Climate change will target every community in America, and we know the poorest and most vulnerable communities will suffer the most. Climate change will cause more frequent and severe downpours in the Northeast, potentially overwhelming aging drainage systems and causing sewerage backups in predominantly low-income areas. Sea level rise will threaten vulnerable communities from Baltimore to New Orleans. More frequent and severe heat waves disproportionately threaten the health of those who cannot afford adequate air conditioning or have preexisting health conditions. State and local leaders are beginning to recognize the need to factor climate risks into infrastructure planning and find creative solutions that protect their communities. For instance, Philadelphia’s Green City, Clean Waters program installed porous pavements, rain gardens, rain barrels, and other green infrastructure solutions to reduce stormwater runoff and prevent sewer overflows. Clinton will give states and local communities the data, tools, and resources they need to make smart investments in resilient infrastructure and to help diminish the local impacts of climate change. Be directed to make recommendations on addressing cumulative environmental impacts and preventing other communities from facing similar burdens in the future, particularly in light of the additional challenges posed by climate change, including through stronger enforcement of Title VI of the Civil Rights Act. Include outside experts, the environmental justice community, and federal, state, and local officials, and draw on all of the resources of the federal government to conduct its work. Be supported by the National Institute of Environmental Health Sciences’ research and partnership grant programs, which Clinton would significantly expand. Clean Energy Challenge: Develop, defend and implement smart federal energy and climate standards. Provide states, cities and rural communities ready to lead on clean energy and exceed these standards with the flexibility, tools and resources they need to succeed. Revitalizing Coal Communities: Protect the health and retirement security of coalfield workers and their families and provide economic opportunities for those that kept the lights on and factories running for more than a century. Energy and Climate Security: Reduce the amount of oil consumed in the United States and around the world, guard against energy supply disruptions, and make our communities, our infrastructure, and our financial markets more resilient to risks posed by climate change. Hillary began her visit to Syracuse today with a roundtable addressing manufacturing. Hillary believes that manufacturing matters because workers who build things here are the heart of our economy. Well-paying manufacturing jobs support families, and making things in America here is critical to our innovation and prosperity. Throughout her career and in this campaign, Hillary stood up for American manufacturing. As Senator, Hillary fought for workers and manufacturers in New York. She stood up to China when they tried to put tariffs on New York’s exports. In communities across the state, from Buffalo to Rochester to Albany, Hillary brought together government at every level, workers, and businesses large and small to join and invest in good-paying jobs and production in the state. Today, in Syracuse, Hillary is providing more detail on her vision for American manufacturing, with a $10 billion investment in “Make it in America Partnerships” that will take her strategy to stand with manufacturers in upstate New York nationwide. This new proposal will be largely paid for based on revenues from Clinton’s previously announced “clawback” proposal that would rescind tax breaks for companies that outsource jobs abroad. While too many politicians and experts in Washington gave up on American manufacturing, Hillary never did. That’s why she believes we need a comprehensive strategy to break down all the barriers to making things here, and ensure America’s global leadership in manufacturing. We need to buy what America makes: hundreds of billions of dollars of investment in our nation’s infrastructure and making America the world’s clean energy superpower will drive demand for jobs, equipment, and production here. And she will oppose trade agreements, like the Trans-Pacific Partnership, that do not meet her high standards for creating good jobs, raising wages, and enhancing our national security. o Harness all of a region’s strengths: Clinton’s plan will use federal resources to take the lead in bringing together workers, unions, businesses, universities, and government at every level to harness their combined strengths to encourage industries to locate in their region, and create jobs and innovation with wide economic benefits. This approach will help ideas for new goods and production methods move from university labs to factory floors to markets across the city, country, and world. This approach will build up supply chains and “upward spirals” of production, good-paying jobs, skills, and innovation so that manufacturing communities across America are the first choice for parts production and assembly, in everything from steel, cars, and aircraft to wind turbines and clean energy products. o A pledge by businesses to keep jobs and investment in America: Businesses participating in Hillary’s strategy would pledge not to shift jobs or profits gained from “Make it in America” incentives to other countries by outsourcing production, or “inverting” to move their residence abroad and avoid paying their fair share of U.S. taxes. Hillary’s plan embraces economic patriotism, and will support companies that invest in their workers and good-paying jobs here in the U.S. But it won’t support companies that walk out on America. When America’s incredible innovators come up with an invention or design, we should also build it here. o Promote participation by smaller manufacturers to build up the entire manufacturing ecosystem and supply chains: “Make it in America” partnerships would include participation by and sharing with smaller manufacturers throughout a region, so they learn the skills they need to thrive and participate profitably in the supply chain. This could include “test and learn” demonstration centers where small manufacturers could learn cutting-edge techniques, or “teaching hospitals” where workers, university and community college experts, and students could learn new skills from each other. That way, we will help small manufacturers become links in the global supply chain so we build things here. o Create good-paying jobs without stealing them from other regions, or undermining labor and “Buy America” standards: Hillary’s proposal will only reward plans that create good-paying jobs. She will not reward regions that simply relocate jobs or production from one community to another. And across her proposals, as she has throughout her career, she will support strong “Buy American” standards, and the right of unions to organize and collectively bargain. Her plan will not allow proposals that undermine worker rights or strong labor and domestic sourcing standards – so that the new manufacturing jobs we create are good, high-paying jobs. o Ensure American competitiveness in the global clean energy economy. Clinton will help American workers and businesses compete for jobs and investment in the $13.5 trillion global clean energy market and advanced vehicles and make all American manufacturing more internationally competitive by improving industrial energy efficiency by one third within ten years of taking office. Achieving this goal will save American companies more than $50 billion a year. Clinton will ensure that American leadership in producing some of the lowest-carbon steel, aluminum, glass and other materials in the world is recognized in the market and rewarded in public and private procurement through a new “Buy Clean” product labeling system. o Crack down on foreign countries, like China, that cheat the rules: If foreign countries dump products on our markets, like China is doing right now with steel, Hillary’s administration will take countervailing action. She will appoint a new trade prosecutor to keep other countries honest. She will take on foreign countries that keep their goods artificially cheap by manipulating their currencies, and expand our toolbox to include effective new remedies to respond, such as duties, tariffs, or other measures. 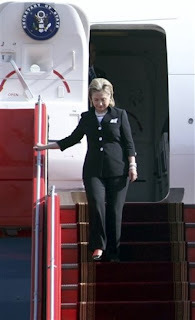 And Hillary opposes China’s efforts to be recognized as a “market economy,” which would defang our anti-dumping laws. o Say “no” to new trade agreements that don’t meet her high bar – including the Trans-Pacific Partnership. Hillary will hit pause and say “no” to new trade agreements unless they create American jobs, raise wages, and improve our national security. After looking at the final terms of the Trans-Pacific Partnership agreement, including what it contains on currency manipulation and its weak rules of origin standard for what counts as a car that can get treaty benefits, she opposed the agreement because it did not meet her test. And she will hold every future trade agreement to the same high standard. o Review the trade agreements we already have on the books. Hillary has said for almost a decade that we need to renegotiate NAFTA, and she still believes that today. And she would review all of our trade agreements with the same scrutiny. o Fight for American exports. U.S. exports total more than $2 trillion dollars and exporters pay workers higher wages. Clinton will support the efforts of businesses large and small to tap new markets – both at home and internationally – to support good paying jobs and spur economic growth. That is why she stands for American workers in the face of misguided opposition by supporting the Export-Import Bank, and other policies that drive American exports. o Revitalize hard-hit manufacturing communities by building on her proposal to provide tax relief to encourage investment in hard-hit areas that have seen jobs and production depart. 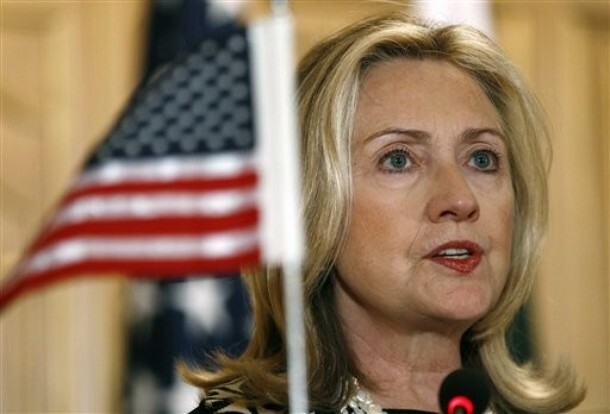 Specifically, Clinton’s plan would make areas that have seen or are about to face significant manufacturing job or plant losses eligible for new investment tax incentives – called the “Manufacturing Renaissance Tax Credit” – modeled on the New Markets Tax Credit to attract new capital, business, and jobs; a zero capital gains option on long-term investments; and relief for renovating, refurbishing, or repurposing plants. o Link this tax relief to a coordinated, comprehensive, government-wide effort to prevent “downward spirals” resulting from departing production in hard-hit communities, and align resources from across agencies to make funds and programs easier to access. 4. Crack down on companies shipping jobs and earnings overseas – and create incentives for companies to bring back jobs to the U.S.
o Claw back the special tax breaks that corporations received for locating research and production here at home if they ship jobs overseas, and use the proceeds to invest in America. o End abusive inversions and impose an “exit tax” on companies that leave America to lower their tax burden. o Provide federal support and tax relief for research and innovation in America, particularly at smaller businesses and startups. o Coordinate government efforts within the U.S. and overseas to recruit and ease the path for companies to bring back jobs to the U.S.
o Double support for the Manufacturing Extension Partnership, a public-private partnership that helps smaller American manufacturers compete. o Expand access to capital, especially for smaller manufacturers. o Encourage proven, high-quality training and apprenticeships – including a $1,500 tax credit for every apprentice hired through a bona-fide apprenticeship program – while insisting on accountability for employment and earnings outcomes. o Expand nationwide credentialing with strong industry input that can lead to more and better-paying jobs in every state in the union. o Build on models that allow federal student aid to be used toward high-quality career and technical training programs with promising or proven records—including traditional career and technical education, and innovative, flexible online programs. o Provide tuition-free community college, and reduce student debt by allowing students to refinance their loans.